We're just six weeks short of Thanksgiving, which means two things: First, if your Thanksgiving/Christmas/New Year plans involve air travel, book your ticket now or suffer the financial consequences. Secondly, if you're looking to get hitched over the holidays and believe in magic, it might be time to bust out the Engagement Chicken. The stretch between Thanksgiving and Valentine's Day has come to be known as engagement season, a time when the calendar presents us with a slew of special occasions on which your paramour could pop the big question. Jewelry companies know this all too well; before you even sit down to your turkey dinner, you'll be hearing about how he went to Jared. The wedding industrial complex will continue the recruitment for months. Okay, Who Let &apos;Engagement Season&apos; Become a Thing? If you're dying to get a ring during this sentimental stretch and willing to do any batshit thing in order to make it happen, then surely you'll want to cook your sweetheart some Engagement Chicken, a legendary dish said to inspire men to propose to the women who serve it. Getting it on the table now is the considerate move — you'll give your beloved a good six weeks to get his act together just in time to pop the question on a Hallmark-perfect holiday. The Engagement Chicken speaks to two things that many women understand: the desire to enter a contractual arrangement in which you'll file joint tax returns with a man, and poultry. If you're the type to Google "how to get him to propose," you are perhaps already familiar with the Engagement Chicken (or as I like to call it, chicken). The dish hit critical mass in 2011 when Glamour magazine released a cookbook entitled 100 Recipes Every Woman Should Know: Engagement Chicken and 99 Other Fabulous Dishes to Get You Everything You Want in Life. The Engagement Chicken is the real star, though, and the cookbook put the dish front and center. But the (in)famous fowl has reportedly been around for decades. As Glamour tells it, fashion editor Kim Bonnell gave the recipe to her assistant, Kathy Suder, sometime in the '80s; Suder made it for her boyfriend, and he proposed shortly thereafter. Like magic. Word spread of this romantic voodoo, the recipe made the rounds around the Glamour office, and three more Glamour staffers got engaged after preparing the same roast chicken. So this chicken popped into my head when assistants worried about their date-night menus, and I shared it with them, spelling out every teeny little step. Success! They'd report back the next morning about foolproof results and rave reviews. And, it seemed, betrothals. Maybe not that very night but with unmistakably related-to-chicken timing. With an eerie predictability, women became engaged to the men for whom they prepared this chicken. Voila: Engagement Chicken. Glamour ran the recipe in the magazine in January 2004, dubbed it the Engagement Chicken, and since then some 70 women have ensnared their dream dude by cooking him a bird. It may take three months or three years, but if you make this chicken, eventually he will propose. The recipe is suspiciously simple: bird, lemon, salt, pepper. The Marcella Hazan original is alive and well (though Hazan never called it an Engagement Chicken because it had not yet acquired magical properties) and true to form, involves just those four ingredients. Hazan's recipe calls for around 90 minutes cooking time, with the oven temperature starting at 350 and eventually raised to 400 degrees. You are to prick the lemons twenty times apiece. But the true Engagement Chicken, according to Glamour, is ever-so-slightly tweaked for the busy modern gal – start at 400 for a reduced cooking time, only prick the lemons a little, and throw some extra lemon juice in there – and adds fresh herbs for garnish (this is a fashion magazine, after all, and presentation matters). Eventually celebrity chefs have gotten in on the Engagement Chicken action: Martha Stewart and her SEO team were smart enough to feature Glamour's recipe on their website. Ina Garten, meanwhile, complicates things by adding garlic, olive oil, Spanish onions, dry white wine, chicken stock, and flour. (If you're making Garten's labor-intensive version specifically in hopes of getting engaged, seek professional help.) And the Neelys offer a recipe for Get Yo' Man Chicken, which is an entirely different dish, but the point is the same: Poultry is the butterfly net with which you shall catch a man. I've been unable to find any wine pairings for Engagement Chicken, but if it's being served to the type of dude who makes a major life decisions based on whether or not someone has prepared a nice meal for him, I'd suggest Heineken. The Engagement Chicken endures because of women who want to believe in magic. Pop culture presents love to us as a sort of magical experience (see: Disney, rom coms, and every pop song ever) and, frankly, it's not unpleasant to ascribe to such a worldview. The romantics among us want to believe love is an interpersonal magic that exists beyond the reaches of science. Science is full of hard and fast rules; magic is the fantasy workaround. Magic is hope. Magic means anything can happen. Magic means we just might be able to manipulate events to our advantage. But when we think of casting spells or creating love potions, we veer into complicated territory: newt spleen and valerian root, dragon wort and peacock feathers, roaring fires and ancient chants. The Engagement Chicken, however, is simple magic. All you need is a grocery store and an oven. The only ancient chants you need to recite are those of easy conversation: How was your day? Can I get you another Heineken? Nevertheless, the Engagement Chicken's longevity isn't wholly a result of this simplicity. It's the promise of magic that keeps women coming back. 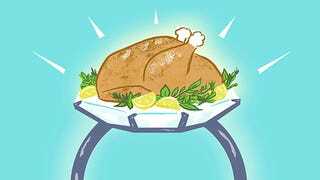 Unfortunately, for those who actually serve the Engagement Chicken – and get a ring on their finger shortly thereafter – the basic recipe likely serves as a preview of their forthcoming marriage: bland meat, sour stuff, a little spice, and small talk. This is I Thee Dread, Jezebel's website devoted to all manners of nonsense pertaining to the wedding industrial complex. Got something worth sharing? Email me. Horror stories welcome.